I spent a good part of my Tuesday running shopping errands before picking up Thing 2 from school. Right before I headed over to his school I decided to make a quick stop at Gypsy Wools. They are a fun shop in Boulder that carry a variety of yarns and fibers, as well as embroidery supplies. They also have a marvelous selection of fiber crafting tools. My main reason for stopping there today was to acquire a few more felting needles and 2 of the Clover Single Needle felting tools. I’ve been doing a lot of single needle felting work lately and my hand gets a bit tired. 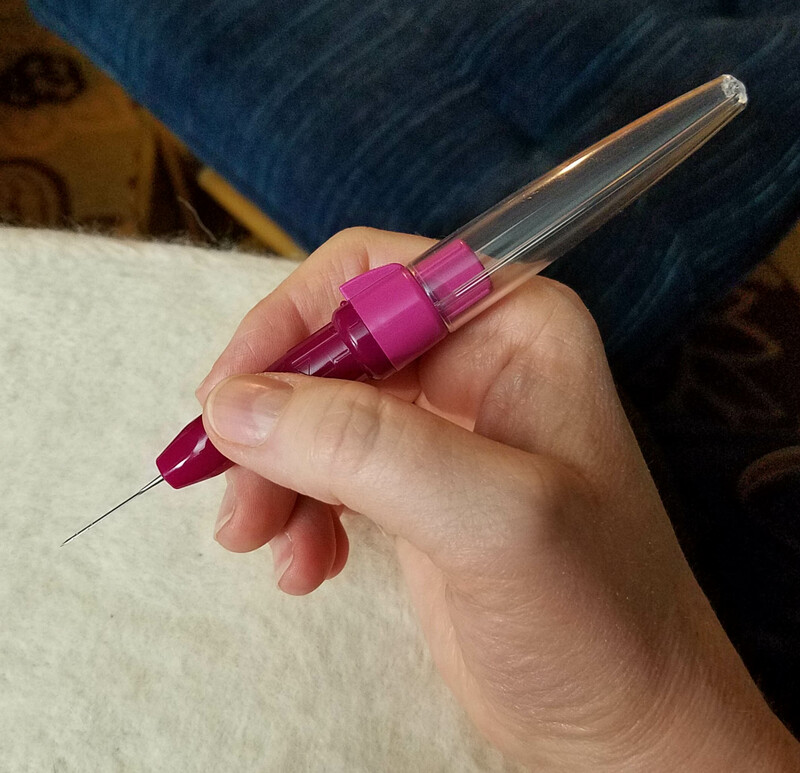 Since finding ways to craft without injury is one of my touchstones, I kept thinking that I needed to create some sort of ergonomic handle for the needle. Then I realized that I had such a tool already. 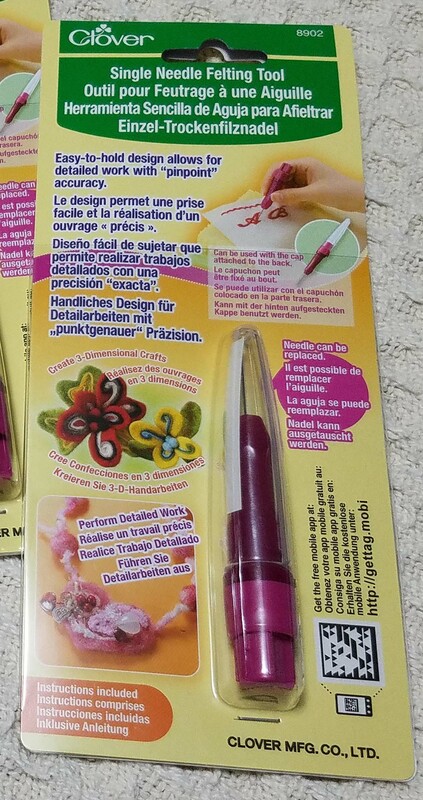 I purchased one of these Clover tools about a year ago and have used it primarily when I am doing details like adding yarn embellishments to a needle felting project. It comes with a 40 gauge needle, which is one of the thinnest. 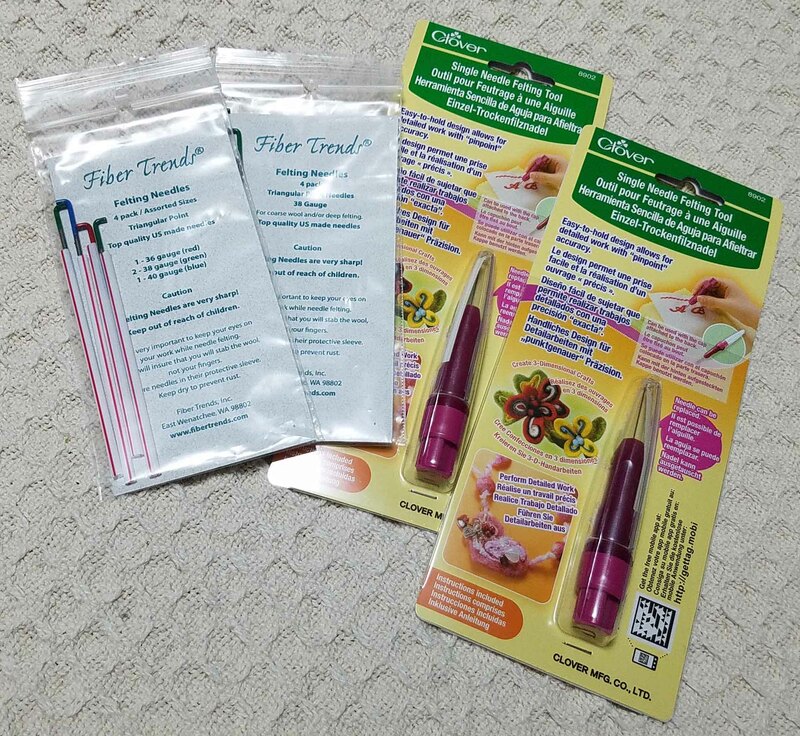 All the Clover Needle Felting tools recommend that when replacements are needed you use the Clover Needles. I do love their needles, but I have lots of other felting needles, and I decided to see how well they would work in the tool. 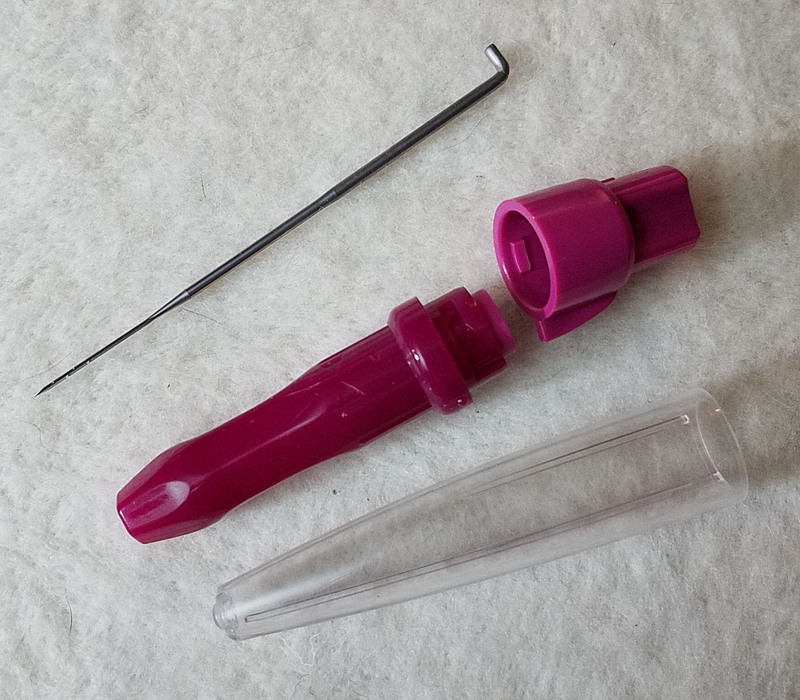 The tool breaks down into 4 pieces: the handle base, the locking handle top, the clear needle cap, and the needle. What makes this tool so effective is the little notch on the top of the handle base. 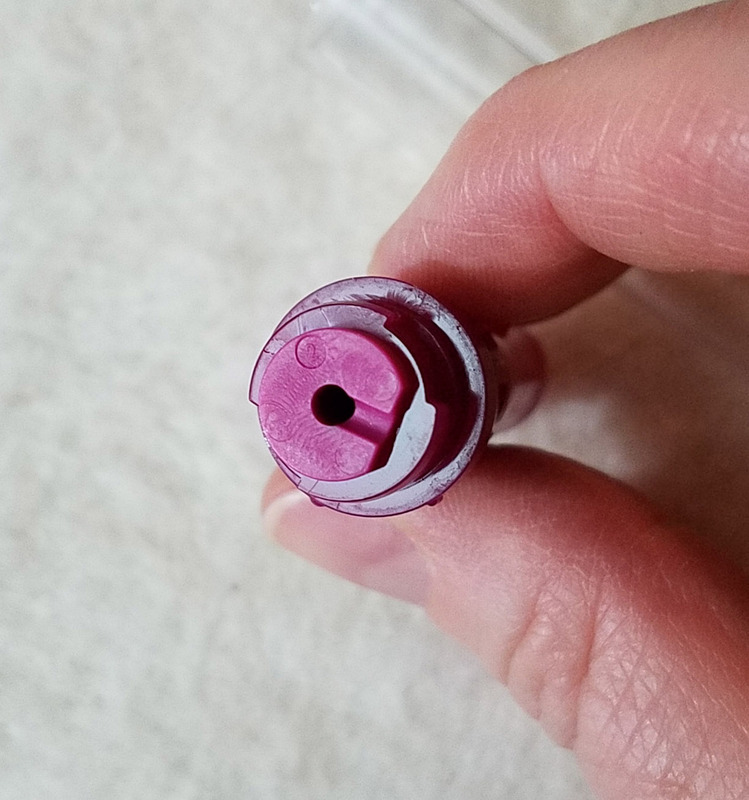 That notch holds the needle in place, so the needle won’t twist in the handle and break when you are working. 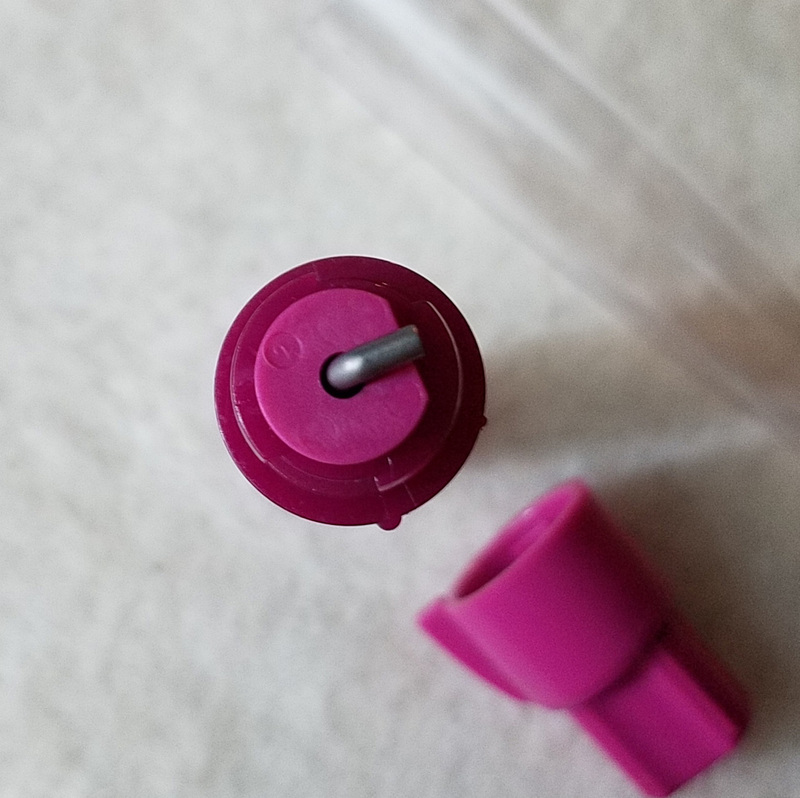 The top of the handle has a metal disc that is firmly held against the top of the needle when the top is locked in place. This is the whole handle reassembled with the needle in place. 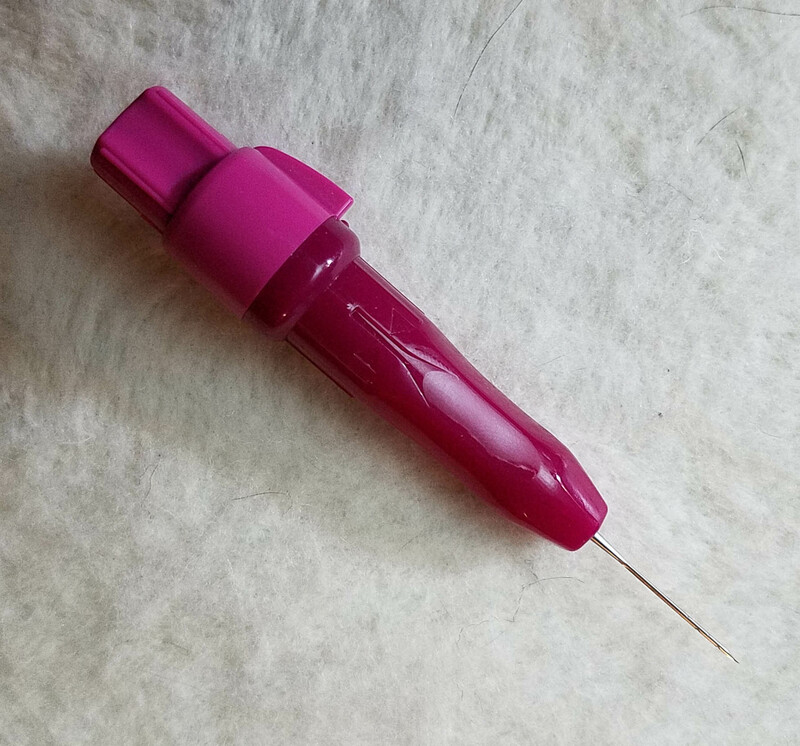 The needle in this photo is 3″ long, so it fits perfectly in the handle and the clear cap can be placed over the needle when the tool isn’t being used. This is a handy feature as it prevents jabbing oneself when fishing around in your tool kit for what you need. 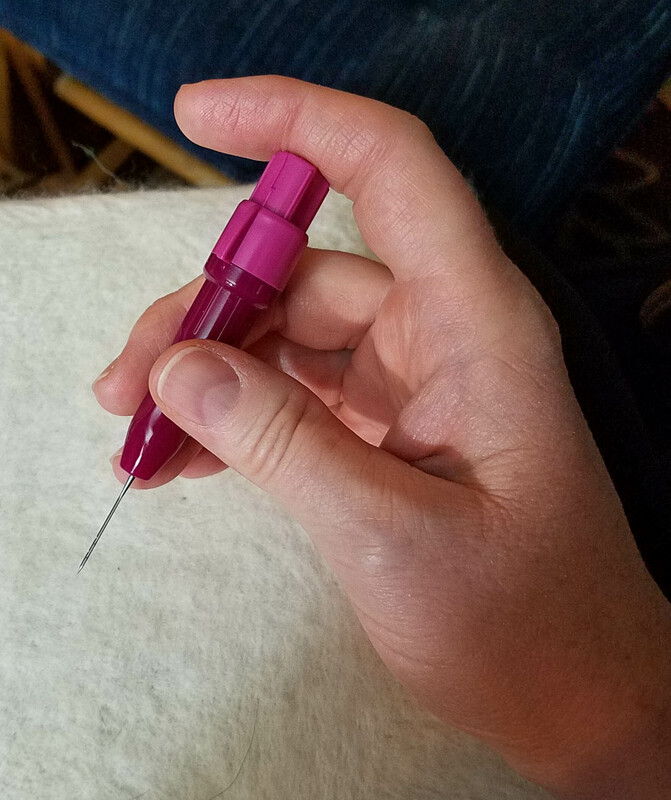 The cap can be moved to the back of the tool when felting, but I’m not a fan of using a pencil hold when doing single needle work. The photo above shows my preferred position to hold my felting needle when working. 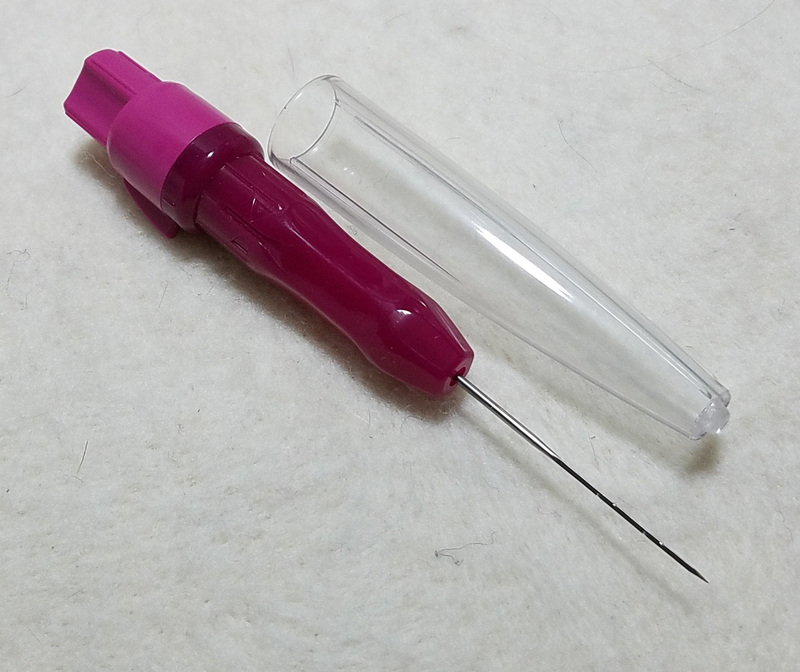 Using the Clover tool works beautifully with my preferred hold, I simply leave off the cap and the shape of the handle allows me excellent control of the needle with a much more relaxed grip. 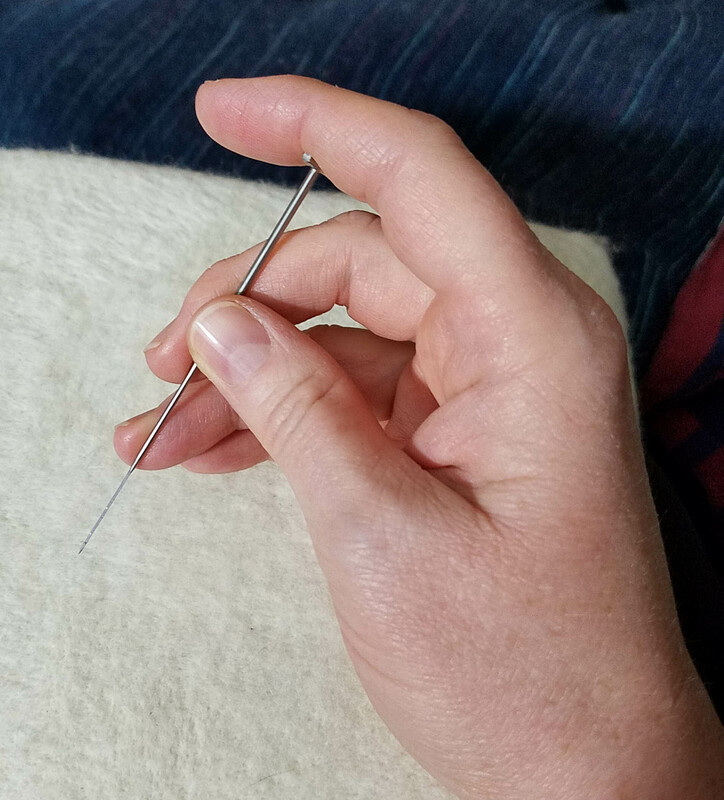 I have found that I prefer to use the 3 1/2 inch long needles when doing single needle work. This means I can’t place the clear cap over them in this handle. I just have to be a bit more aware of where the sharp ends are when I’m reaching for a tool in my kit. Though, I am finding with the additional length from the handle top, I may be liking the 3 inch needles better when using the Clover tool. I am using my Clover handle much more now, and decided that I needed more of them. This way I can have a different gauge needle in each handle. Which is what motivated my trip to Gypsy Wools today. Now, you remember at the beginning of this post, I said that I had planned a quick stop to just get some needles and tools? As you can see from the photo below, I ended up with a bit more than tools. The very helpful (one might say enabling) Barb said, “Have you seen all our loose fiber we have on sale? It’s 50 cents per ounce” Whoops. 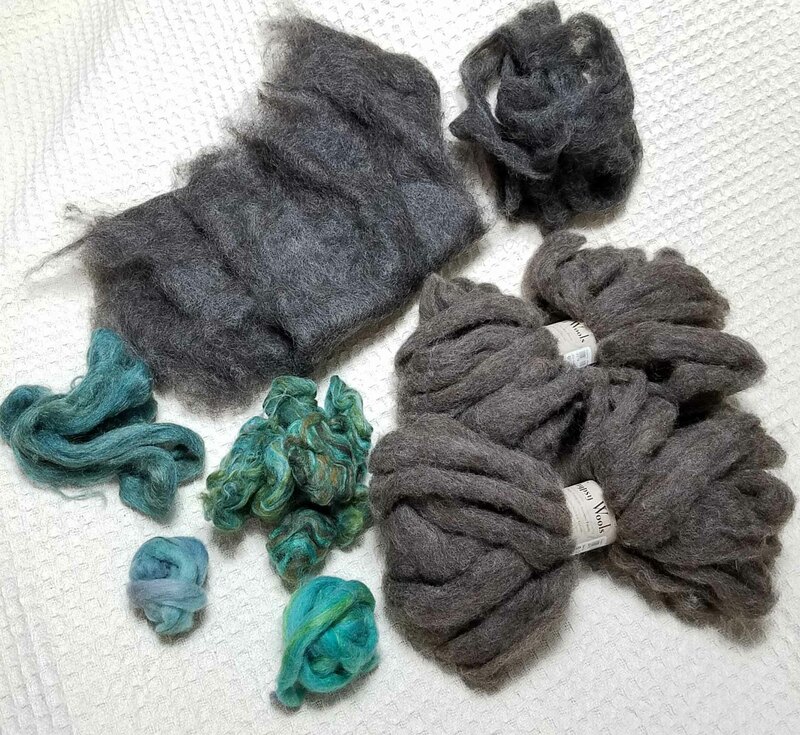 I now have 8 ounces of some wonderful dyed and natural colored fibers to play with. There was even a bit of fiber that was a partially felted sheet that intrigued me. It is probably a good thing I couldn’t stay longer or even more may have ended up in my basket. Some of the green stuff is a combination of wool and silk. I’m really looking forward to experimenting with needle felting it. Despite all the running around today I did manage to get a little crochet time in. I’m still working on my “super secret” projects for a magazine, which means I can’t share photos of my progress on those right now. Of course, my crochet design brain never sleeps, so I also came up with an idea for a new project this evening. I’ve been wanting to do something with this beautiful linen yarn from Juniper Farms for ages. I have 2 balls of it and have made a couple of tries that I ended up pulling out. I’ll be crocheting some swatches with it tomorrow to see if this latest brain storm is going to come out as nicely as I hope. More on that soon. Right? 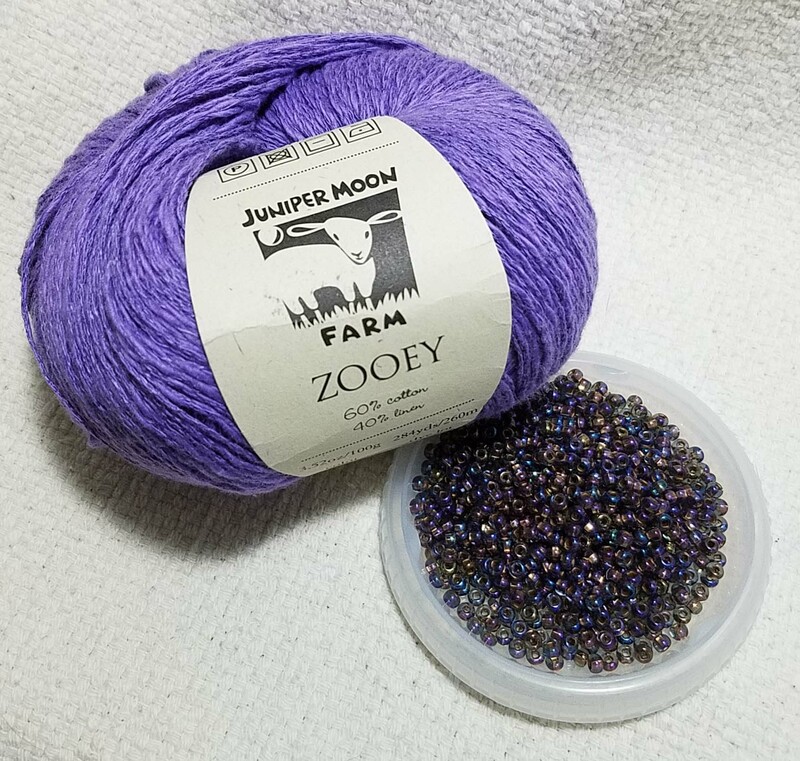 Fiber and yarn sales are why I end up breaking my yarn diet frequently.